In 1876 Niels Larsen, a county surveyor in Cuming county, Nebraska, patented (see US patent No. 183403) a calculating machine for taxes and interest. The instrument is designed for calculating taxes and interest with speed and accuracy. It consists of three concentric cylinders, which are movable independently of each other, and the two outer ones provided with openings, allowing portions of each cylinder to be seen. The cylinders bear numbers, the inner cylinder representing hundreds, the middle one tens, and the outer one units. By properly moving the cylinders the tax or interest upon a given sum or amount will be exhibited through a stationary shield. The three concentric cylinders (see the upper patent drawing), A B C, are capable of receiving each an independent movement or rotation. The inner cylinder is fixed on a shaft or axis, G, which has its bearings in the side pieces of the stand F. The middle and outer cylinders are provided with sleeves, which are movable upon each other and the shaft G, and both the shaft and sleeves are provided with milled heads E for rotating the cylinders. The shield F, bears the name of the tax, or the number of days or months for interest, and it is perforated in such a manner as to expose to sight only the amount upon which tax or interest is to be calculated, and the amount of the tax or interest. 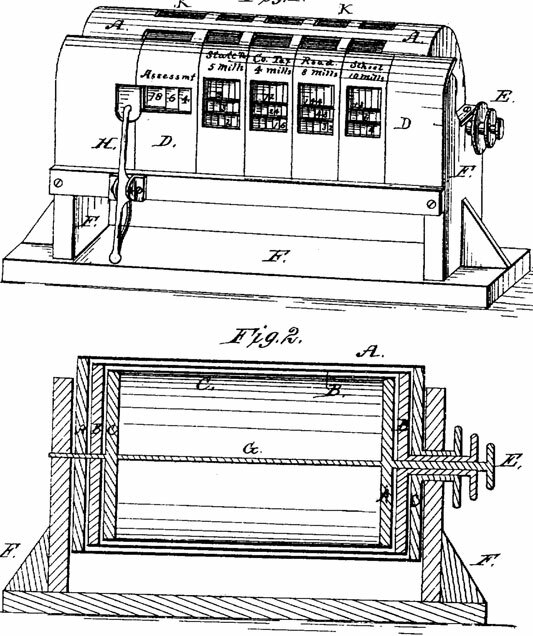 The operation of the machine for calculating taxes is as follows: To determine the tax on an assessment of seven hundred and sixty-four dollars, bring the figure 4 on the outside or unit cylinder to view in the opening of the shield under the word "assessment," and let the spring-catch hold that cylinder. Now bring the figure 6 on the middle cylinder to view in the same opening, and in line with the figure 4 on the first cylinder, and let the spring-catch also hold the middle cylinder. Now, by bringing the figure 7 on the third cylinder to view in the same manner, the amount of the assessment can be read. This having been done, we find in the appropriate column for each kind of special tax indicated on the shield three lines of figures—those on the outer cylinder representing the tax on four dollars, those on the second cylinder the tax on sixty dollars, and those on the third cylinder the tax on seven hundred dollars. The three sums are then added together mentally by the person using the machine, and entered in the tax-list. Not much is known about the inventor—Niels Larsen (besides the above-mentioned patent for calculator, he was a holder of two more US patents—for a candle holder (US patent No. 151297 from 1874) and for a sun-dial (US patent No. 281527 from 1884)). Niels Larsen was born in 1830 and died on 2 June, 1891, in West Point, Nebraska. During the Civil War he served as an ensign and then as a 2nd lieutenant in the artillery of US Marines (steamers Niphon and Grand Gulf). After the war in late 1860s and early 1870s Niels Larsen served as a county surveyor of Cuming county, Nebraska. Then he worked as a surveyor and mine-seeker in Colorado, before to settle in West Point, which he surveyed and platted in 1869. In 1880s and early 1890s he worked as a cashier of West Point National Bank.